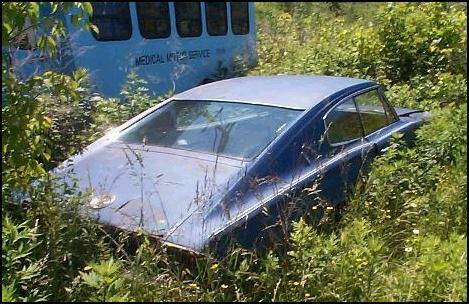 Here is a 67 Hemi Charger that is being swallowed up by grass and weeds. This is the way it appeared at that web site along with the caption. These were snapped just outside of Rochester, NY. They are amongst a whole bunch of wrecked Corvettes and old Chevy's. The Charger is reputedly a Hemi, at least whenever you ask the junkyard owner for anything off it he just says, "Not splitting that up - it's a Hemi!" It's also been there for a long time and is rusty as heck. Never got a chance to check the engine, too many snakes!